Basic agricultural chemicals have been used for centuries, but the genesis of modern agrochemical manufacturing is dated to the 1950s and the first industrial-scale manufacturing of β-Hexachlorocyclohexane (B-HCH). This organochloride was primarily used to improve the yield of cotton and wheat farms but was subsequently banned after studies found that B-HCH was neurotoxic to animals and humans. Despite decades of research into targeted pesticides, the difficulty of engineering active ingredients that are lethal to pests and non-toxic for humans remains challenging. Active ingredient and inert chemical compounds are routinely applied as seed treatments and fertilizers to increase crop yields, and preservatives to improve the cosmetics of the final product. There are numerous initial and secondary benefits to using such agrochemicals, including higher product yields to support an exorbitantly growing global food demand and the unquantifiable economic advantages represented by a consistent and sustained food supply that is broadly resistant to various environmental factors. Pesticides are now firmly entrenched in the human food chain, to the extent that agrochemical substances that were banned decades ago can still be found in soil samples from agricultural sites around the world. It is therefore important to analyze food samples for pesticide residues to understand the reactivity of industrial active ingredients in agricultural ecosystems. Evaporators are critical for determining the presence and concentration of pesticides in the food and drink that humans are consuming. They are primarily used to concentrate homogenized samples for further examination, typically through controlled heating and metered introduction of nitrogen gas. Typical pesticide analysis requires analytes to be extracted from the sample through mechanical agitation before they are concentrated using an evaporator. Evaporators usually use a dry heat source for sample sizes of up to 250 ml, with nitrogen recovery procedures to improve the sustainability of pesticide analysis. Open evaporators introduce nitrogen to concentrated samples in test tubes or well plates via sterilized stainless-steel needles. The manifold gas can be heated in conjunction with the base plate to ensure outstanding thermal uniformity throughout the evaporating process. 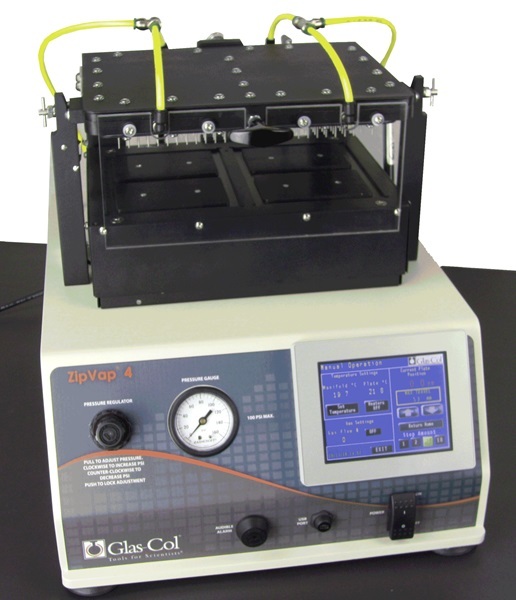 Glas-Col’s ZipVap4 evaporator features a hinged manifold for simple loading and unloading of well plates. An accessible electronic user interface allows full control of process parameters for improved automation, ensuring the highest standards of extract concentration prior to the extraction clean-up stage of pesticide analysis. If you would like any more information about using our evaporators for pesticide analysis, or you have other application requirements, please do not hesitate to contact us.